Due to increased investment, the once traditional hamlet of Les Carroz is rapidly growing. Usually in the shadow of its big brother, Flaine, Les Carroz has expanded to cover a large area on the road up to Flaine. This means that it benefits from shorter transfer times from Geneva but, due to its lower altitude (1140m), offers less reliable snow. 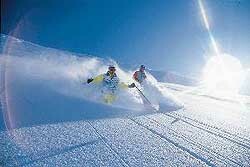 However, it is linked to the Grand Massif domain, where the skiing is extensive and all abilities can flourish. When snow is good, Les Carroz is excellent for beginners, with gentle nursery slopes down into the town. Boarders can access the park in Flaine and enjoy fantastic off-piste that constantly delights, with Flaine's altitude a guarantee for good all-season snow. Perhaps the worst (or best, depending on your perspective) feature of Les Carroz is the lack of any really good nightlife or non-skiing activities. 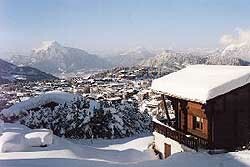 Generally, it's a good venue for families, as well as being popular with any Genevois zipping off for a weekend ski. Remember that it's low altitude, so if you want to ski to your door, Flaine may be the better option.